When the global chemicals manufacturer Innospec asked us to design a new brand identity for an anti-static product, we knew we would have to create a new approach. As a niche area of the industry, anti-static products have typically been marketed using all-too-familiar images of static balls and bolts of electricity. We needed to create a new direction, one which would draw attention to Innospec as an innovator in the market, highlighting the advantages of using their anti-static Statsafe™ products. Innospec develops and manufactures fuel, oil and performance chemicals for a broad range of industries. The company is truly global in its reach, with sites in North and South America, the Far East, Africa and Europe. Our project was led by the sales and marketing team for Statsafe™, part of the Plastic and Polymers division at Ellesmere Port in Cheshire. Our challenge was to come up with a brand identity which would appeal to distinct audiences which require the product for different reasons. 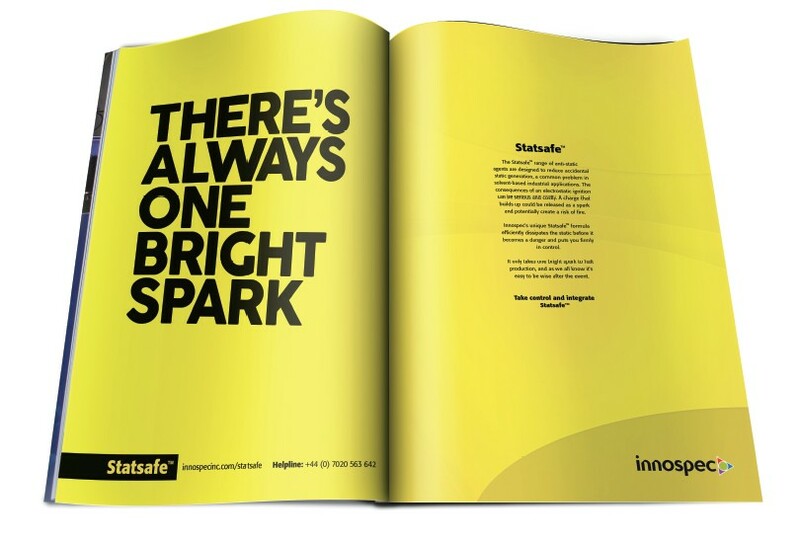 Our client wanted us to capture attention, communicate the benefits of Statsafe™ and, importantly, give personality to the brand. Put simply, Statsafe™ is a range of anti-static agents and static dissipaters that can be added to a variety of different products to reduce static. This is necessary because a charge can build up in solvent manufacture and this can then lead to a fire or explosion. Another significant advantage in using Statsafe™ is that it can help to improve productivity by reducing the need for site shut downs, as well as protecting valuable manufacturing equipment. 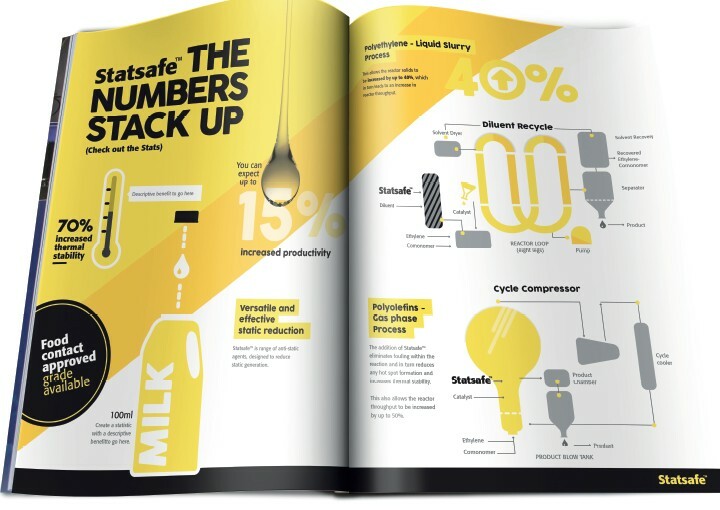 Development of the new Statsafe™ brand identity began with a thorough immersion into the product range, the target market, features and benefits and the sales and marketing plan. Statsafe™ is, by its nature, a complex product, and it has distinct target markets which value its features and benefits for different reasons. Our creative concept needed to have broad appeal across the target markets, while underpinning the overall Innospec brand. When developing the creative concept for Statsafe™, our research showed that typical images for products of this nature were the tried-and-trusted library images of electricity and static. While we needed to work within the boundaries of Innospec’s established brand, we wanted to present back creative concepts which were bolder and braver, with a credible message. We decided to steer clear of imagery and focus on intelligent messaging in a distinctly authoritative and confident yet quirky tone of voice. The creative concepts comprised a series of strong message statements designed to peak interest and draw the target audience in to wanting to learn more about the product range. These messages were designed to be thought provoking, and read with a sense of humour. We wanted to compel people to ‘look, and look again’ which provocative lines using bold typography on a distinctive yellow background which is recognisable as being part of the Innospec brand. “The reason the creative concept works so well is because it is built on a thorough understanding of Statsafe™ and Innospec. This understanding enabled us to come up with a simple, straight-forward creative concept, but one which had depth and meaning to the features and benefits of the parent company and Statsafe™ product range.” Matt Townsend, Director at Ultimate. 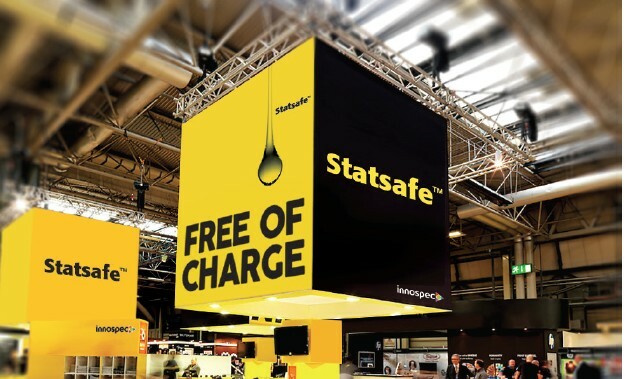 The new brand identity for Statsafe™ will now be applied to various marketing channels, including exhibition stands, brochures and product literature and infographics.